The following laptop models have one of the Dell recalled batteries. If your battery turns out to be recalled, you will be eligible to receive a replacement battery from Dell. However, the wait time will probably take over a month. You can try our battery exchange program where we can ship you a freshly refilled genuine Dell replacement battery for your laptop. These batteries are NOT among the recalled batteries listed by Dell. The battery will be shipped together with a prepaid return postage label and box for you to send us the recalled battery after you receive it. All you have to do is send us your recalled battery that you have after you receive our replacement. 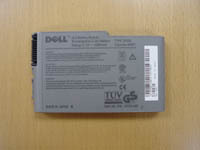 Another option is to purchase a replacement battery from us while you are waiting to receive your replacement from Dell. This will help prevent any downtime while waiting for your new battery from Dell. Every battery comes with a 1 Year Warranty!!! Our battery refills and sales offer the least expensive prices on the market. If you have any further questions regarding this battery please call us at 909-268-8741. We will send the battery first $49 - On Sale!!! Genuine Manufacture's Battery $69 - On Sale!!! The battery capacity increases every few months and Dell Latitude D500 Series battery packs have 2160mAh capacity Sony Li-Ion cells. The new cells we are using to replace your batteries are 2200mAh LG Chemistry Cells. As a result of the refill service, a 4320mAh capacity Li-Ion battery pack increases to 4400 mAh capacity. This means longer run-time (5% higher capacity) compared to the original without causing any incompatibilities.